Modern Dance Technique I Sem. 1 and 2. Class 1, studio 2, cr. 2. (May be repeated for credit.) An introduction to the techniques and principles of modern dance. Ballet I Sem. 1 and 2. Class 1, studio 2, cr. 2. (May be repeated for credit.) An introduction to the techniques and principles of classical ballet. Jazz Dance I Sem. 1 and 2. Class 1, studio 2, cr. 2. (May be repeated for credit.) An introduction to the principles of jazz dance techniques: alignment, isolations, rhythmic patterns, and basic locomotion. Dance Improvisation Sem. 1 and 2. studio 3, cr. 1. Prerequisite: none. A study of the elementary principles used in the design of modern dance movements. Contact Improvisation Sem. 1 and 2. studio 3, cr. 1. Prerequisite: none. (May be repeated for credit.) This course is both a physical practice and philosophical exploration of the contemporary partnering dance form Contact Improvisation. This form uses movement, touch, momentum and weight-sharing to explore dancing with other people. We will find moments of balance, inversion and flight by learning to support and be supported by other bodies. We will focus on connections and sensorial awareness as we practice rolling, lifting, falling, jumping, catching and finding the body's center. Modern Dance Technique II Sem. 1 and 2. Class 1, studio 2, cr.2. Prerequisite: none. (Three semesters of DANC 10100 or equivalent is highly recommended before enrolling in this course.) (May be repeated for credit.) A continuation and refinement of the modern dance techniques and principles addressed in DANC 10100. Ballet II Sem. 1 and 2. Class 1, studio 2, cr.2. Prerequisite: none. (May be repeated for credit.) A continuation of the principles and techniques of classical ballet addressed in DANC 10200. Jazz Dance II Sem. 1 and 2. Class 1, studio 2, cr.2 Prerequisite: none. (May be repeated for credit.) A continuation and refinement of the jazz dance concepts and movement vocabulary addressed in DANC 10300. Biomechanics Of Dance, Movement and Strength Sem. 1 and 2. Class 1, studio 2, cr. 2 Prerequisite: none. (May be repeated for credit.) This course will provide conceptual and experiential understanding of biomechanical approaches to ballet technique. Through studio, lecture, movement exercises and assignments, the students will learn to perform ballet movement with ease, strength and economy of motion. Practicum In Dance Performance And Production Sem. 1 and 2. studio 3 or 6, cr. 1 or 2. Prerequisite: open through audition and instructor approval is required. Corequisite: DANC 20100, 30100, 20200. (May be repeated for credit.) The study and practice of dance rehearsal, performance, and basic concert production techniques, culminating in a main stage dance concert. Dance Appreciation Sem. 1. Class 3, cr. 3. Understanding and appreciation of dance as an art form. Topics include compositional forms; movement styles; elements of danceand influential choreographers, dancers, and theorists representative of various historical periods and aesthetic points of view. Modern Dance Technique III Sem.1 and 2. Class 1, studio 2, cr. 2. Prerequisite: none. (Three semesters DANC 20100 or equivalent is highly recommended before enrolling in this course.) (May be repeated for credit.) A continuation and refinement of the modern dance techniques and principles addressed in DANC 20100. Emphasis placed on expressive qualities of movement. Choreography Sem. 1 and 2. Class 1, studio 4, cr. 3. Prerequisite: none. (DANC 14000, three semesters of DANC 20100, or equivalent is highly recommended before enrolling in this course.) An introduction to the theory and practice of the principles and utilization of choreographic tools; movement exploration, manipulation of basic dance elements, development of movement themes, and application of compositional dance forms. Intermediate Choreography Sem. 1 and 2. studio 3, cr. 1. Prerequisite: DANC 34500 and instructor approval is required. 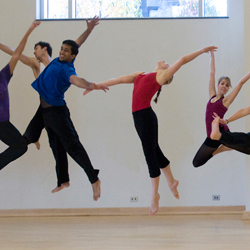 A study of selected principles underlying the design of group performance in modern dance. Special Problems in Dance Sem. 1 and 2. Prerequisite: consent of instructor. (May be repeated for credit.) Individual readings, topics, or projects in dance.